Well, I don´t have a reason why this is my favourite movie. For certainly, it is not, but I liked it very much so I will talk about it. 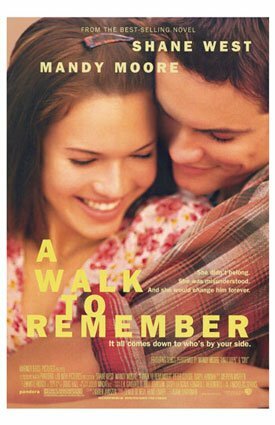 This movie is about the most popular guy in the school( Shane West) , who was arrogant and used to make bad things to the others. Then, as a punishment, he must participate on a school drama; that´s when he meets a girl ( Mandy Moore) and learn many things he didn´t know about life and, he falls in love with her. Nevertheless, she has a secret that implies on her not being able to have relationships… the reason I can´t say, you should watch the movie, but you have to keep in mind that probably you will cry, the end is very sad. The point is that this movie shows how life can be good in the same time as simple, and how a human being can be changed because of love. As a guy, I don’t know how much I would appreciate watching such a romantic movie like this one. I know you are going to say that Moulin Rouge is a romantic movie and all, but it is just that those Hollywood flicks seem to follow the same formulas all the time and I am not really into them so much. Also, I don’t know the main actor and actress so much, so I don’t know if I would really enjoy it.